This post isn't meant to claim moral superiority, to set hard and fast rules about shopping or to shame anyone who uses a capsule wardrobe. It's to admit my own self-centered thinking about my wardrobe and to encourage everyone, including me, to shop more intentionally. If you read a fair amount of lifestyle blogs or fashion blogs, you've probably come across the "capsule wardrobe." While this might feel like a very modern, minimalist response to consumerism and fast fashion, the concept of the capsule wardrobe dates back to the 1970s. For those of you new to the capsule wardrobe, it's a very classic (and frankly French) approach to style. Ideally, you build up a wardrobe with just a few high-quality, timeless pieces that mix and match. Each season, you switch to a new "capsule," although some pieces might overlap. Your accessories can be trendy, but your clothing should all be classic. Eventually, you only need to buy a few things -- or even nothing! -- each year. I spent my first three years out of college living out of two large suitcases. I mastered the art of mixing and matching my clothes to make new outfits. I developed a very critical eye for both what I could add to my wardrobe, and what I should purge from my wardrobe. Once I moved into my first apartment, and I bought my darling (but small) antique dresser, I quite inadvertently developed my own "capsule wardrobe," just with two seasons instead of four. I might have a larger closet in my new townhouse, but I still plan on packing away my fall/winter clothes in storage. In fact, my spring/summer wardrobe is fairly complete. While I just splurged on a new tank top and two new pairs of sandals (in white and in black), any further fashion spending will probably be for alterations on my existing clothes that are too big. I ended up with a small wardrobe because of limited space. But according to the women who blog about their own capsule wardrobes, they do so as a reaction to owning too much. They are overwhelmed by their clothes, and yet still feel like they have nothing to wear. Embracing the capsule wardrobe is their solution to their closet woes. And they're hardly alone. What is the cost of fast fashion? As clothes have become cheaper, our clothing consumption has gone through the roof. In 1930, the average American woman owned an average of nine outfits. Today, we each buy more than 60 pieces of new clothing on average per year. Our closets are larger and more stuffed than ever, as we've traded quality and style for low prices and trend-chasing. In the face of these irresistible deals, our total spending on clothing has actually increased, from $7.82 billion spent on apparel in 1950 to $375 billion today. But, the true cost of fast fashion isn't the billions of dollars we spend on excessive clothing. The true cost is the 12 million tons of clothing Americans throw away each year. The true cost is the 168 million child workers worldwide. The true cost is the lives of the 1,137 confirmed dead at the Rana Plaza building collapse in Bangladesh in 2013. What if our capsule wardrobes weren't about us? What if we changed our shopping habits not to become more fashionable, but more ethical? What if we minimized our wardrobes not to make our lives easier, but more sustainable? What if we stopped putting ourselves first, but instead prioritized the global community? I don't claim to have all the answers or to have made all the right choices for the right reasons. Last year alone, I bought at least one dress and three skirts in the "fast fashion" category. But, I know I can make better decisions about what I buy, and if you're reading this, I think you can, too. Danielle Vermeer is a blogger who has truly encouraged me to think twice about: 1. How much I buy, and 2. What I buy. She's written a great guide on buying ethical fashion on a budget. For more tips about shopping and upcycling, or to learn more about the hazards to garment workers across the globe, check out her ethical fashion tag. Back in 2013, my friend Christina challenged herself to wear only 7 garments for an entire month. She chose two pairs of shoes, two long-sleeved shirts, one tank top, a pair of jeans and a skirt. Undergarments and outergarments didn't count. While this challenge might not be possible in all circumstances, it does reveal what is truly a need versus a want. It's so easy to think we need new clothes when we really don't. Even for special occasions, the sort of circumstances when we rationalize only wearing something a few times, we can be more conscious of how much we buy. I've worn the same pair of gold wedges now to five weddings, and my wedding rehearsal in the last two years. 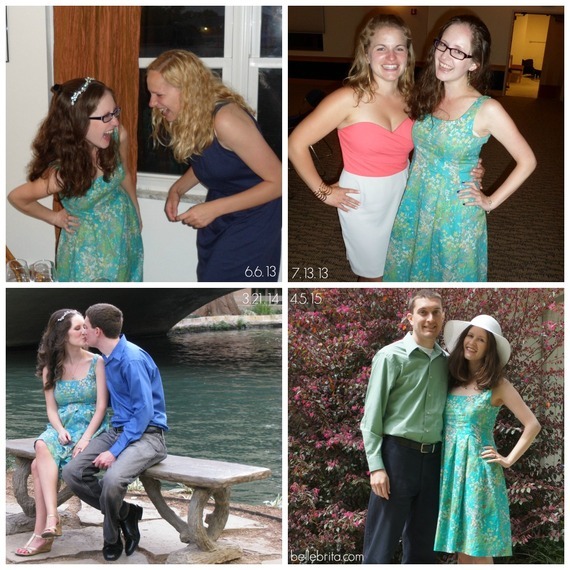 I wore my favorite sundress for my 26th birthday, to my cousin's wedding, for my wedding rehearsal, and for Easter Sunday (see photo collage). So should we spend our dollars only at small businesses and avoid the cheap, often-exploitative brands altogether? It's a nice sentiment, but it's still idealistic and financially inaccessible for most. Elizabeth L. Cline, in her 2012 book, Overdressed: The Shockingly High Cost of Cheap Fashion, proposes some solutions to worker exploitation and overconsumption, such as teaching proper mending and laundering techniques, sewing one's own clothing, buying vintage and shopping at local stores. Cline also suggests "shopping less and with more intention." Final thoughts on fast fashion and capsule wardrobes. Our individual choices might not matter that much, but, together, we can make a difference. Adapted from "Fast Fashion and the Capsule Wardrobe," originally published on Belle Brita.